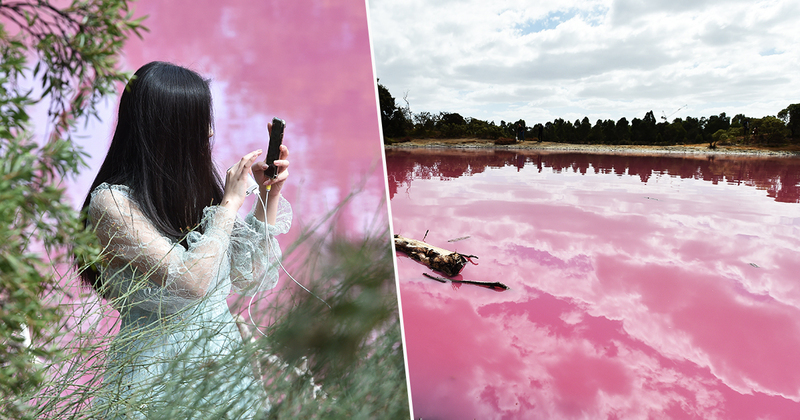 A lake in Australia has turned pink and has thus become low-key Instagram famous. The man-made salt lake in Melbourne’s Westgate Park has turned a striking bright pink in recent weeks. People have since flocked to the park to capture the phenomenon on camera. According to TripAdvisor, Westgate Park is a nature sanctuary located in the heart of industrial Melbourne. It used to be a wasteland in amid the city’s industrial aesthetic, but authorities have put a lot of money into transforming the area into an outdoor haven for wildlife. The park has since emerged as one of Melbourne’s most vibrant examples of how a wasteland can become a flourishing ecological and recreational wetland environment, and so attracts tourists, photo-seekers and animal lovers alike. Located along the eastern banks of the Yarra River under the Westgate Bridge, the park offers spectacular views to the mouth of the Yarra and the city skyline. The healthy bird population also attracts bird watching enthusiasts. But it’s the saltwater lake which has captured the attention of visitors every summer since 2013, when natural phenomena turns the waters a dashing shade of hot pink. However, authorities have had to warn visitors not to get too close, as the water’s high salt levels can irritate sensitive skin. It’s not, in fact, full of strawberry milk, as one Instagram influencer joked. The vivid shade is produced by lots of sunlight, low rainfall and warm temperatures. In those conditions, the lake’s algae and halobacterium work together to produce a red pigment called beto carotene, according to Westgate Biodiversity signs erected on the banks. On social media, people also warned others of a pungent “rotting eggs” smell; a metaphor for how not everything is as it seems on The ‘Gram, perhaps? The lake’s pink colour typically lasts through to late Autumn, until cooler temperatures restore it back to blue. So there’s a time frame in which you can don your best hot pink outfit and get the perfect shot for your social media followers. Just don’t go for a swim. The man-made lake at Westgate is ‘quite deep’, you see, as it’s less than a kilometer away from the sea. The phenomenon can be seen in other pink lakes in Australia, Spain, Canada and Senegal, but lakes of this colour are ‘very rare’, according to the park keepers.